Rolls Gracie was known as the fighter in the Gracie family. Rolls originally became the lead and taught many students in Brazil. Rolls was a talented son and student of Jiu-jitsu under Grandmaster Carlos Gracie, and his brother Helio Gracie. Rolls was a technician, a fighter, a philosopher and a champion. He epitomized the essence of what we should see in a Black belt in martial arts. Rolls was a pioneer that influenced the greatest Jiu-jitsu black belts of today. Many notable men under Rolls were Rickson Gracie, Carlos Machado, Rigan Machado, and many others. Rolls was a man that gave to his community. On June 6, 1982, Rolls Gracie died during a hang gliding accident in the mountains of Mauá. What a tragedy. This young man that developed what we know as the open guard and other tools of modern day Brazilian Jiu-jitsu. Very similar to the tragic death of Bruce Lee, who he himself influenced top martial artists including Chuck Norris. We have unfortunately our own tragic version of Rolls Gracie. I have had the privilege to know, teach and train my top Black belt and senior Black belt Gary Claxton for 11 years. Gary tragically died too soon on Thursday, January 6. This young, talented Jiu-jitsu Black belt of mine was too young to die at barely 50. His 50 was more like a late twenties. And he kept getting better each year. I met Gary when he moved to Austin in 2000. He always came to class and attended as much as he could. He was always the last one to leave the mat. I have had many talented Black belts who have been very giving and good leaders that follow my philosophy, but Gary was something even more. He also had those gifts and he also became my other Black belts big brother. There is not one of my Black belts who did not gain in life, Jiu-jitsu and as a person from Gary. He helped everyone. He was also my general of our Vandry BJJ army, as he led others, always helped those newer students and was always loyal to our community. I remember when Gary first started competing. He won the Jean Jacques Machado National grappling games in California, and he has won numerous State titles. He won in 2009 the Abu Dhabi grappling championships in California. I wrote an article on Gary a while back because I was so proud of my top student, his achievements, but even more his drive to overcome. Gary was always proud of our academy, and he always gave me the greatest amount of appreciation and compliments a student could ever give to an instructor. 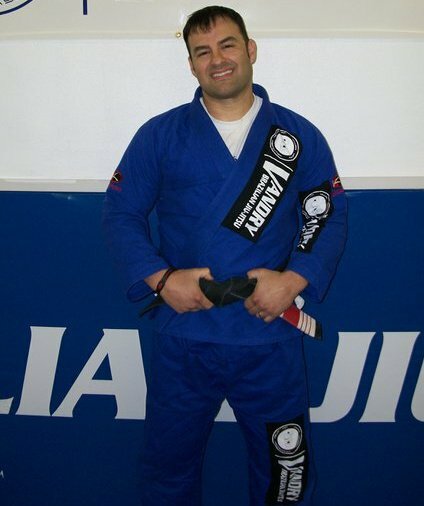 Gary always protected our students, did not tolerate bullies and more so, Gary was kind enough to always let me know how Jiu-jitsu was making a tremendous impact on his life. When Gary began training with me in 2000, he had already trained in BJJ under a Rickson Gracie association in Tennessee. Gary also had a wrestling background, and good skills at BJJ. He had developed, trained and sparred with me many times over the years, and has won state championships and won the Jean Jacques Machado tournament years ago. Gary is a true man of grit, honor and a true fighter defined as a BJJ black belt. Gary had two neurosurgeries on his spine a few years ago, and was told his career in BJJ was over. I personally talked to Gary many times on this, and we reflected my own personal head trauma years ago in which I too was told by my neurosurgeon that I needed to accept a retired life. I never allowed that to overcome myself, and I went on to compete in three more world championships. Gary went on to compete as well, and become even better at his Jiu-jitsu. Gary was a talented singer and use to play at the Continental club in downtown Austin. He was too young, too talented and too giving to leave this world so soon. This man and champion is going to be missed every single day, but I guarantee he will never be forgotten. He was a close student of mine, and a very noble Black belt. Gary was succeeded by his wife, and in this article I note that here at Vandry BJJ, I have started a Gary Claxton memorial fund. This fund you can see on my website, and it has a Paypal link to it or drop a check off in class. If you read this, knew Gary or just happened to stumble here or even live somewhere else, every penny is graciously appreciated. 100% of this fund I started will go to his wife. In my life, I have always learned to develop the greater good for others and the future. I hope you do too, as we are a community of martial artists that support each other. I myself have dug in my pockets many times during the years, and yes, in this world the word thanks is overlooked, not used, and I myself from experience know that many people I personally have helped in my past have been affected in a positive way, although you can always have a minor group that do not appreciate, are grateful, thankful and simply cannot make their own lives positive or positive for others. We still have to work to help those, and right now all of you who helped Mrs. Claxton with the fund, I thank you, and I am in debt to you for your loyalty, your giving, your time, your contribution to our community and your selflessness to reach into your pocket for a very needed help. I have processed the transaction and made sure Mrs. Claxton has received this help. Thank you all from the bottom of my heart that donated. I appreciate it from so many people that can post support for Gary on a forum such as facebook, or support for his wife. I also appreciate so many that did not simply post the ‘too bad’ type comments on facebook and then forget the whole subject or even fail to take a moment to donate. The real friends, and family that will always remember Gary Claxton I want to thank my community that stood up and donated. I want to thank my Master, and instructor Carlos Machado for his support and his donation as well as men like Carter Fisk, Doc Snow and Manny Galvan. You men are the ilk of true knights from the medieval times. Thank you Ed Aiken and my awesome Webmaster Wes Collard for helping me to get the paypal account up and running on the website. I salute you and all the numerous others who helped out in this tough time. I have a wonderful community. One of my Black belts Manny Galvan from the valley area South Texas who was also a close friend of Gary’s went out of his way to do a seminar to raise funds for Gary’s wife. That has been deposited in our paypal fundraiser, and those actions speak much louder than any words. My thanks to you Mr. Galvan. I also thank my other black belts that have contributed, supported this cause and areas. These men are of the type of ethic and martial arts mentality that set examples for everyone. It also shows you the value of your fellow students. I have many students that wish they would have come one more class, wrestled or talked to Gary one more time. I remember Gary’s last time in class. It was a Tuesday night, and whenever I see one of my black belts in class, if they are around, I try to train with each of them. I do it because I try to tweak their games, as well as get a chance to train with my top students. A past Friday there were three Black belts Ed, Carter and Matt and brown belt Troy, and I trained with all of them. Why? Because I know they look forward, tired or not to keep developing. I am so glad I trained with Gary three rounds for about 25 minutes his last class. Master Carlos Machado told me that he was so glad he trained with Gary last time when he was kind to teach a seminar at my academy in September 2010. I always think about the importance of today. For those of you who know me, you may know I had a terrible head trauma over 13 years ago. It set me back, and it took me almost a year to just recover physically. I have never discussed much of this public besides a few interviews in the past with some news items, but I do want to state one thing. I know how valuable each day is. When I see a student tired, I will train with him half speed more to work out, but not to wear him out. I usually go just one step above a student when training. This helps them to tweak their game and adjust. When you are a student, there are times when you are a bit tired, or maybe there is a football game on, or maybe even a good movie. At times we may stay home instead of training. This develops into a habit. Always try to get one more class. Always try to make it. If you are a bit tired, just train technique. If you are injured, watch on the side. If you have a movie on, record it or just save it for later. Don’t take your training for granted. Don’t use the gym new years resolution curse by stating “I will get back next week.” Then it becomes next month, then months later. Gary always came as much as he could. As you see with Gary Claxton, use every single day you can. I spoke with my dear friend and mentor Master Carlos Machado on the phone. We discussed overcoming, and developing strategies to overcome and how valuable each day is. Always maximize your goals for tomorrow by working on them today. And I note that in cases like this; don’t forget someone like Gary either. Turn this into something positive. He set the standard for what a student should be. He always had time to mentor, help, work out with or train with a fellow student. He was always someone that held pride and gratitude for our academy and always gave me what I am so grateful for; he always let me know how much he valued me personally and my instruction as an instructor. That is priceless, and very appreciative. I will never forget Gary Claxton. I will always keep him in mind, and I will always be grateful and thankful for what he did to contribute to our community with all of my black belts, students, and friends. I appreciate all the times we ate dinner, talked, the times when I got to hear about when he started Jiu-jitsu, about his singing, and so many other things. I appreciate the times when he gave credence and respect to Master Carlos Machado. I remember him telling me when he got to wrestle with Carlos at the last clinic in September. He wanted to train with Carlos each time he came down, as he was always impressed with his technique. I am impressed and thankful that for 11 years I was blessed to have this man as my student, my friend, and a brother of Jiu-jitsu and in my life. Thank you Gary, I know you are in Heaven looking down on us smiling and probably playing a guitar singing with the angels. Rest in piece my little brother; I will make sure you are always remembered.